Hello, Hello! I hope you had a great Memorial Day weekend. We decided to spend it as a family and had so much fun at the beach, doing yard work (yes that's fun to me!) and visiting friends and family. We had beautiful weather here in UP and I know quite a few people who enjoyed it so much they got sunburn. Some got REALLY bad sunburn. So this blog is for them, and any of you who may be in the same boat. This is a super quick DIY-talking 5 minutes quick- as long as you have the ingredients. I put this up on my Instagram stories too, and they will be on my highlight reel if you want to see videos there. The first step is to spoon about 1 cup of coconut oil into a pot. Then, turn on the heat and melt the coconut oil until it is completely melted. Once the coconut oil is melted, you can add 24 drops of Lavender and mix that into the coconut oil. (24 drops is for 4 oz of finished product. If you're doing less, reduce the amount of Lavender too). 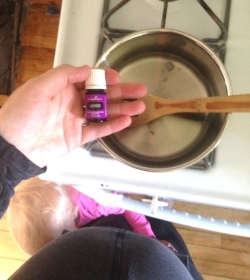 Once you mix in the essential oil, then you can put the mixture into a jar and ta-da! You're done! It's that easy. Before using, let the mixture cool down a little, most likely back to a harden texture like regular coconut oil is. Then, you can apply the sunburn relief a few times a day until you feel like you've healed and redness has gone down.